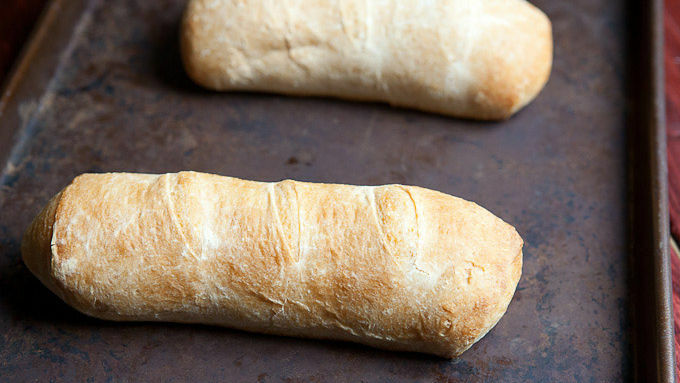 Divide Pillsbury dough into two small loaves. Bake according to directions, but subtract five minutes from total baking time since the loaves are smaller. Remove when the loaves are golden brown and cooked through. Let cool briefly. 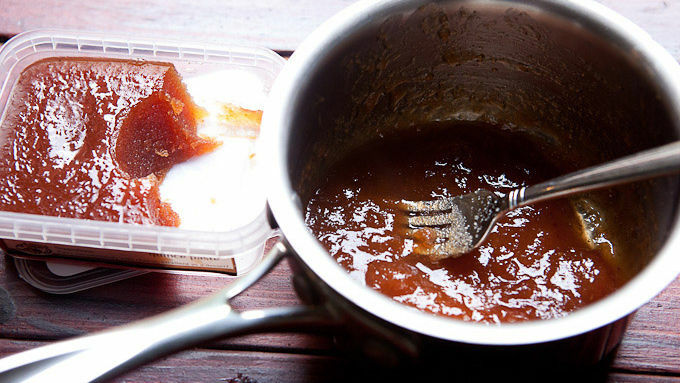 In a small pot, combine membrillo with 1/4 cup of water and heat over low heat. As it heats, mash the paste until it loosens a bit. When it's warm, it should have a jam-like consistency. Slice loaves in half lengthwise. Spread each piece of bread with the quince paste. 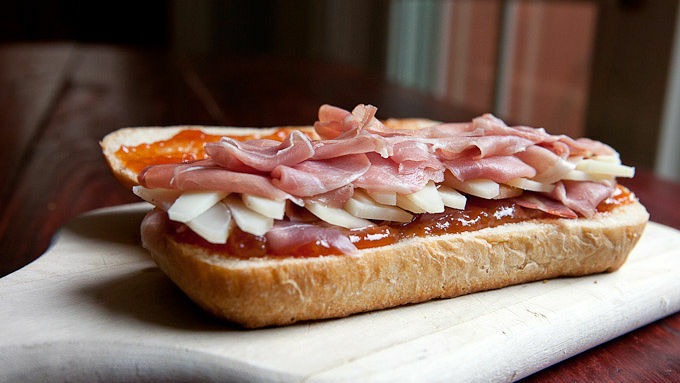 Stack on some ham (or prosciutto) and layer on the manchego cheese. In a large skillet, melt butter over medium low heat. Once melted, add sandwiches and cook for a few minutes per side. It might help to add some weight to the sandwiches as they cook. 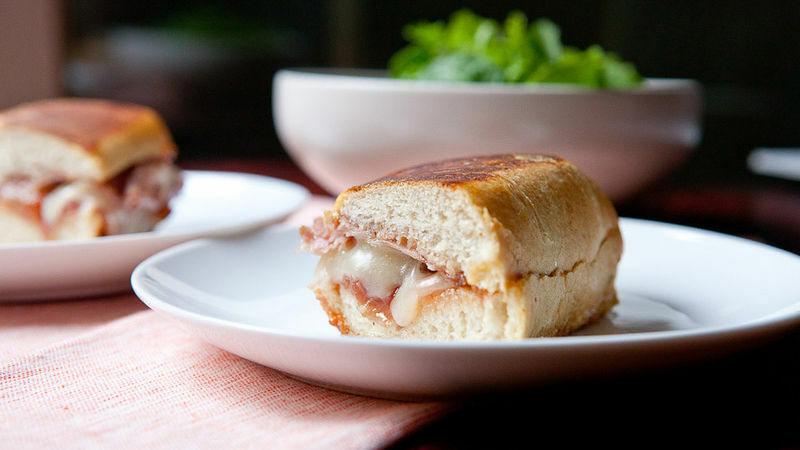 Cook the sandwiches until they are lightly browned and the cheese is melted. Alternatively, you can cook the sandwiches in a panini sandwich press. Serve while warm! Classic Spanish ingredients on crusty bread make this grilled cheese sandwich pull away from the pack. The Spanish are good at many things, but maybe at the tippy top of the list are cured meats and cheeses. They are experts at them, really. So it only seems right to see if we can’t stuff some of their best stuff in a delicious, buttery grilled cheese sandwich. Actually, we should probably make two! While you could use any bread for this, I quickly baked a loaf of Pillsbury French Loaf. Instead of baking it as one large loaf though, I split it into two, which will be the perfect size for our sandwiches! Besides the bread, you just need some basics. I used some salty and creamy manchego cheese, quince paste (also called membrillo), and prosciutto or Serrano ham. This stuff is all pretty accessible these days, but I do recommend trying to buy the best you can afford – the quality really matters since there aren’t many ingredients in the sandwich. The membrillo might be tricky to find, but it’s normally in small tubs in the deli section. It’s really thick stuff, so you’ll want to heat it over low heat with some water to loosen it up a bit before slathering it on the bread. A little grilled cheese tip: If you want the cheese super-melty, add a drizzle of water to the pan and immediately slap on a lid. The steam will melt the cheese, but just be careful not to add too much water or it will make your bread soggy. Slice and serve these bad boys as soon as possible. It's a very delicious sandwich!